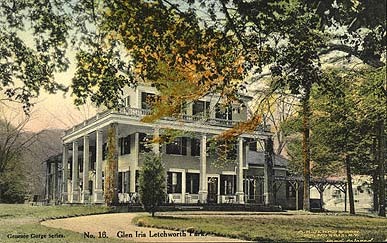 "No 16 Glen Iris, Letchworth Park"
A.H. Jenks & Sons, Mt. Morris, N.Y. Published by The Albertype Co., Brooklyn, N.Y. This handcolored postcard can be dated because of the work underway at the Museum in the lower right of the image, beyond the Glen Iris. Scaffolding is seen near the doorway, giving a 1912/13 date. At this time the Glen Iris has just begun to open for dinners and lodging to tourists to the new State Park.